Made with rigid vinyl, this attractive 5-in-1 Loose-Leaf Binder will definitely help you easily protect 8-1/2" x 11" full sized logs. The JJ Keller 11731 features three D-Rings for extra bind capacity. Includes horizontal pockets with full-size sheet divider to provide a firmer surface for writing and prevent image transfer to forms below. Measures 10" x 11-5/8" x 1-1/2" spine and made with black vinyl material. 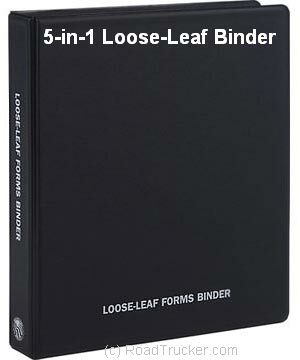 White lettering, says, "Loose-Leaf Forms Binder"